Writing your own scavenger hunt clues can be a lot of fun, especially when you vary the types of clues you create throughout the hunt. ... and will help spark your creativity the next time you plan a clue based scavenger hunt. A. Take a picture of the location of a hidden clue. Give a young child a photograph of the mailbox their next clue is hidden in or, as in the sample below, a picture of an entire clock. For a teen or adult hunt try photographing a small portion of a hidden clue's location to increase the difficulty (eg. If the next clue is hidden behind a clock in the livingroom, photograph a portion of the clock or even just one of the numbers on the clock). Use this idea in a hunt that moves from clue to clue or create a list of pictures whose locations need to be found within a certain time period. B. Cut up the picture of a hidden location into 3-4 pieces for a young child, 8-10 for older children, or 12-20 pieces for teens and adults. Put the pieces in an envelope or scatter them in a designated area. Players have to assemble the pieces to find the location of their next clue. You can photograph the location yourself or use any graphic that depicts the hiding location (eg. a picture of a fridge can be drawn, photographed, clipped from a magazine, or found online). Before cutting up the picture, be sure to write the location of the next clue on the back or front of that picture. A. Rebus puzzles are a fun way to create scavenger hunt clues. For example, a picture of an apple minus the picture of an ape plus a picture of an ant equals a hidden clue location in or around a plant (Apple - ape = PL + ant = PLANT). Rebus clues can be made as difficult or as easy as you wish. Especially for children, it is a good idea to leave dashes below the puzzle indicating the length of the word the clue is pointing to. A fun variation is to create a rebus rhyme clue. A sample clue would be... "Your next clue is hidden in an area that rhymes with,,," followed by a picture of a hat, a cup of tea, and the letter "O". Hat-tea-O rhymes with PATIO, meaning the next clues is hidden on the patio somewhere. B. Writing secret codes is another way to generate clues. Using numbers in place of letters is an easy way to create the code (eg. 1=a, 2=b, 3=c, etc. ), but using pictures or symbols can add a little something special. Using the number code 2-1-20-8-18-15-15-13 = BATHROOM, so once deciphered, hunters would know to look for their next clue in the bathroom. For children, it's best to include the code needed to decipher the clue along with the clue. For adults, it's fun to sometimes the leave the code out, provided the clue is long enough to form a pattern that makes it possible to deduce the code. A variation for an adult clue would be to use the numbers on a telephone. Since each number coincides with three different letters, the code becomes more challenging. The code clue for COMPUTER using a telephone would be 2-6-6-7-8-8-3-7. Be sure to note on the clue that hunters will need to use a telephone to decipher the clue. C. Wordsearch clues involve making a small word search puzzle. These are easy to design on graph paper. If you are creating a clue for stove, write the letters for the word stove in succession in your squares. If making a clue for a child create a word search 5 by 5. STOVE will fill 5 of the squares, leaving 20 squares. Fill the other squares with the letters of a word that shares no letters in common with STOVE (eg. RUG). In this case all extra squares would be filled in random order with R's, U's and G's. The clue would read... "Cross off all of the letters found in the word RUG. The remaining letters will spell the location of your next clue." See sample below for a 6 by 6 wordsearch clue for FENCE. For a teen or adult clue you may want to use a harder hiding location and create a larger box. You may also want to scramble the letters for the clue within the puzzle rather than entering them in succession. Not everyone can write a rhyme clue quickly or easily, but having a look through some Dr. Seuss or nursery rhyme books can inspire you and give you the feel for writing a rhyme clue. If you still find it hard, try and use part of a nursery rhyme to start your clue. For example, "One, two, buckle my shoe" might inspire you to write a clue like... "One, two, find my shoe. My yellow sneaker holds a clue." If you're great at writing rhymes, the sky's the limit. A. Add extra letters to camoflage a hidden clue location. For a child you may take a hiding location like GARAGE and add all kinds of X's to hide the word GARAGE (eg. XXXGXXAXRXXXAXGXXXEEEEE). The clue would read.... "Cross off all of the X's and circle the remaining letters to find the location of your next clue." For teens or adults you may want to scramble the letters if using this same clue. A variation of this idea for teen and adults would be to write a sentence with the clue location hidden in an unexpected sequence of letters. For example SOFA could be hidden without the underlining in a sentence like... "The leaves of an oak tree are green." The clue would read something like... "Your next clue location is hidden in the following sentence. The letters are written side by side and sequentially, but may involve more than one word in the sentence." B. Write a clue location with dashes in the place of every vowel. For a child that might be D _ S H W _ S H _ R for dishwasher. For a teen or adult the whole clue could be written with no vowels. For example, Y_ _R N_XT CL_ _ _S H_DD_N _N _ SM_LL BL_ _ B_ _K _N TH_ L_BR_RY would be "Your next clue is hidden in a small blue book in the library. C. Write a clue backwards and instruct children to hold it up in a mirror in order to read it. For teens and adults a much longer clue with tiny letters make this clue more challenging. Also, throwing in extra words or weaving two sentences together can help make this type of clue harder. A. Create an anagram puzzle by giving definitions of various words that, when entered correctly in the list, will spell a hiding location by reading the first letter of each word top to bottom. You may also stagger the words, provided you somehow highlight the line down where the clue location can be read once the puzzle is completed. b. Create a trivia clue by asking a question and having several answers available, some right and some wrong. Each answer is typed on a separate piece of paper with the scrambled letters of the next hiding location written beside the correct answers and spoiler (wrong) letters written beside the false answers. The clue for CLOSET would be written something like this... "There are 10 movie titles included with these instructions. Each movie title has a large single letter to the far right of it. Brad Pitt acted in 6 of the 10 movies. He did not act in the others. Decide which ones he acted in and unscramble the letters to the right hand side of each to discover the location of your next clue." Be sure to include the answers on separate cards or slips of paper with one letter beside each. Since the clue in this example is for CLOSET, no letters found in the word closet were used next to the incorrect answers. It is up to the hunters to determine which answers are correct and unscramble the letters beside the correct answers to find the location of their next clue. Thanks for writing on something that I didn't give much thought to. No wonder my scavenger hunts ended in disaster! In that case, I'm guessing that when you sent the love of your life off on a scavenger hunt to meet you at a surprise romantic location... she never found you? Maybe next Valentine's Day you can start with a clue written on the bathroom mirror, that leads to a lace nightie with a clue attached hiding inside her pillow, that leads to a suitcase already packed with a clue attached, that leads to a location where a limo is waiting to whisk her away for a romantic evening, that leads to... well I'll let you decide that. Just be sure the clues lead her to the right places. I will definitely use these ideas in our homeschool. 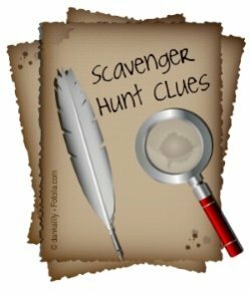 I can hardly wait to plan a scavenger hunt for my children! Thanks Carletta! If you're looking to incorporate scavenger hunts into your educational program, I have some fun library hunts and school hunts in my archives. I'll see if I can pull a few of the clue ideas up and add them to this page. Scavenger hunts will keep kids occupied as they are fun! It sounds like fun. I'll organize one for my relatives. I always make scavenger hunts for my kids for their Christmas presents. They look forward to it every year. I'm running out of ideas and these are some great ones that I'm going to incorporate in their hunt this year. Thanks! I always loved scavenger hunts, even as a teen. The clues were the best part! 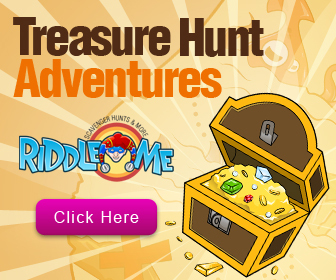 A scavenger hunt as part of a pirate theme party would just be over the top fun, matey! Indeed! I've actually hosted some pretty fun pirate hunts, including some challenging ones for teens and adults. I LOVE pirate parties too, even more so since the Pirates of the Caribbean movies made their debut. This is a very helpful article, but it came to my attention that your last example is incorrect. Brad Pitt was in Interview with a Vampire, but there is no 'D' in the word 'CLOSET'. I thought you might like to know. Will probably use your ideas one day. Great job! I don't know where you get the energy or the ideas for this stuff. Keep it up and lets see more of the same. Out of all the sites I was able to find with ideas, I am happy to say that you have done the best job at showing me creative ways in writing my own clues! This was a great amount of help! I do plan on buying one of the books, but for now I will take the ideas that were given, which was wonderful (the party is this weekend). I have 3 children and I love to do theme parties. You will hear from me again. Thank you! I'm making a scavenger hunt as part of a high school theater's pirate themed senior banquet activities and I was terrified that I'd have to come up with a riddle for every clue. I'm not good when it comes to solving or creating riddles. So, these ideas are life savers. Mixing different types of clues will make the hunt a lot more fun and challenging. And I love that you gave ideas in each section for both kids and teens/adults. Thanks so much. I'm glad you found the ideas helpful. I'm not sure when your banquet is, but I did a pirate themed clue scavenger hunt for older teens a while back... mostly based on the Pirates of the Caribbean, but nevertheless. Some of the ideas may help you. If your banquet is a little ways away still and you'd like some additional inspiration, feel free to contact me. It may take me a few days to get back to you due to my schedule. Just saw your reply. I would have loved to see your other ideas, but the banquet is tomorrow. Most of my pirate stuff was also related to the Pirates of the Caribbean. The banquet is being held in the theater (on the stage) so some of the clues were based on theater things like Shakespeare. I'd never done anything like this and I was asked with only a few days to do it. Putting a scavenger hunt together is a lot harder than it seems, but, I have to say, all that work really challenged my logic and creativity and that was pretty fun. 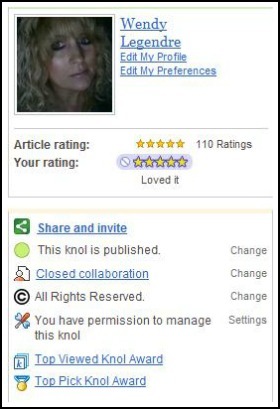 I was constantly referring to this article whenever my brain began to swim, it really helped to anchor me, stirred my imagination, and gave me focus. Thank you so much for posting. And thanks for the offer of extra help. I really appreciate that kindness. Congrats! I'm sure your event is going to be fabulous and you'll create a lasting memory for those students. Hope you'll brag about it here afterwards. I know I'd love to hear all of the details and what the reaction of the students was. I'm guessing others would too.